On May 3rd, Kepi and I celebrated our second wedding anniversary. We decided that for our yearly anniversary celebration, we'd visit the place where we got married - Hershey Gardens. 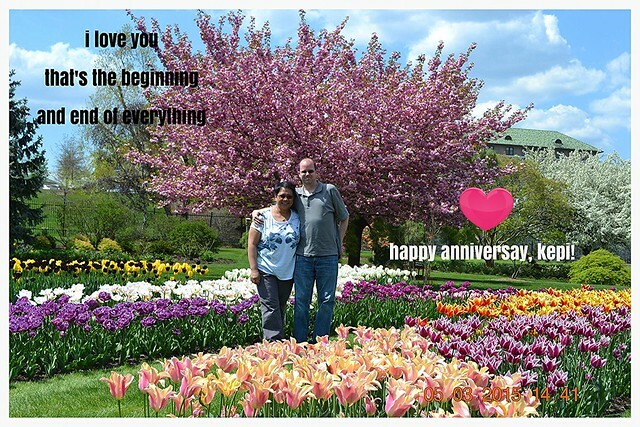 There are three reasons why: (1) the place means so much to us; (2) the tulips and cherry blossoms are in bloom, just like the day we got married; and, (3) we "always" visit the Hershey chocolate factory for sweet treats. May 3, 2015 - It was a day of gorgeous weather and beautiful blooms. This is where we held our wedding ceremony and reception. Happy Anniversary! You chose a fabulous site for your marriage. I grew up close to Hershey, PA but now live in CO. I hope you got some chocolate! Gorgeous photo to celebrate with! Happy Anniversary to you! It's a beautiful place to celebrate your special day. Beautiful place Karen, and happy anniversary! Happy Anniversary, Kayni and Kepi. Love the place, so scenic! Happy Anniversary! A gorgeous and perfect place for your wedding ceremony...so full of blooms! Happy belated anniversary. What a great tradition ... And a beautiful place you picked for your ceremony and to revisit. We toured Hershey ... Grounds and factory, but it was in the fall.... Obviously we picked the wrong time of year to visit. The chocolate was great tho! Congratulations! Happy belated 2nd anniversary. You already have an anniversary tradition. How cool! Cheers to many more days like this. Georgious place to celebrate! congratulations to the both of you and may you stay together forever! What a very beautiful place! And the tulips! I love tulips! 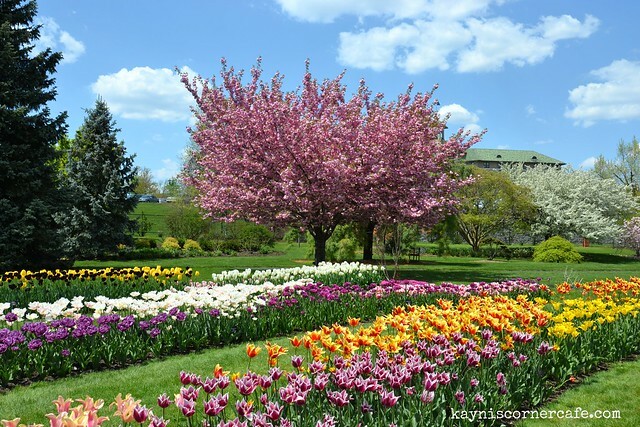 The place where you met, the chocolates, the blooms --those are more-than-good-enough reasons to visit the Hershey Gardens each year. Happy anniversary to the both of you! Sweet. Happy anniversary! My parents celebrated thir 40th anniversary on May 3rd too! Beautiful! What a great place to get married:) Oh, and happy anniversary!